The second of the two classes unique to the Pathfinder RPG that I felt I needed to convert in order to run the Iron Gods adventure path in 5E is the Alchemist class. The Alchemist is a bit of a “grab bag” class in PF, with three main distinguishing features that don’t seem to relate to each other thematically, other than all being “alchemical”; tossing fiery bombs, brewing transformative mutagens, and creating potion-like spells called extracts that mostly provide buffs to the alchemist and his allies. Due to the mechanical differences between PF and 5E, I decided to make some fairly substantial changes to the Alchemist in order to make a version consistent with 5E design (discussed below in my Dungeon Muser’s Notes), but I think this version of the Alchemist will feel like the PF class at the table. With that in mind, here is my draft version of the Alchemist in 5E D&D! HIT POINTS Hit Dice: 1d8 per alchemist level. Hit Points at Higher Levels: 1d8 (or 5) + your Constitution modifier per alchemist level after 1st. As a master of advanced alchemical studies, you can craft certain alchemical and magical substances, such as alchemist’s fire and healing potions, in your downtime in half the time normally required (so a vial of alchemist’s fire that would normally take 10 days of downtime crafting to create would only take 5 days for an alchemist to create). Further, due to your advanced skill and training, you only consume half the raw materials normally required (so, a vial of alchemist’s fire that would normally require 25 gp worth of raw materials only requires 12 gp and 5 sp for an alchemist to create). This ability only applies to healing potions and does not apply to any other potions. At 1st level, you choose an alchemical college shaping your practice of alchemy. Choose from the colleges of Beastmorph, Chirurgeon, Psychonaut, Reanimator, and Vivisectionist, each detailed at the end of the class description. The college you choose grants you features at 1st level and again at 6th, 10th and 14th level. Each college has a list of formulae – its college spells – that you gain at the alchemist level noted in the college description. Once you gain a college spell, it is added to your formulae book for free. If you have a college formulae that doesn’t appear on the alchemist formulae list, the formulae is nonetheless an alchemist formulae for you. As a student of formulaic alchemy, you have a formulae book containing formulae that show the first glimmerings of your advanced understanding of alchemy’s deeper mysteries. Formulae behave like spells in potion form, and as such their effects can be dispelled by effects like the dispel magic spell. Although you don’t actually cast spells, you do have a formulae list that determines what formulae you can create. The Alchemist table shows how many casting slots you have. The table also shows what the level of those slots are; all of your casting slots are the same level. To create one of your alchemist formulae of 1st level or higher, you must expend a casting slot. You regain all expended casting slots when you finish a short or long rest. You prepare the list of alchemist formulae that are available for you to cast. To do so, choose a number of alchemist formulae from your formulae book equal to your Intelligence modifier + half your alchemist level, rounding up (minimum of one formulae). The formulae must be of a level equal to that of your casting slots. You can change your list of prepared formulae when you finish a long rest. Preparing a new list of alchemist formulae requires time spent mixing reagents and chemicals, and infusing them with your own magical aura: at least 1 minute per formulae level for each formulae on your list. You cast a formula by infusing it with magical energy as a bonus action. You activate the formula by either using your free “interact with object” action (as described on page 190 of the Player’s Handbook), or taking the Use Object action if you have already interacted with an object on your turn, as if imbibing a potion, and the effects of a formula exactly duplicate the spell upon which its formula is based, save that the spell always affects only the imbiber. You need not activate the infused formula immediately, but a formula immediately becomes inert if it leaves your possession, reactivating as soon as it returns to your keeping. You cannot normally pass out your formulae for allies to use (but see the “infusion” discovery below), but you can apply formulae to them using an action. Once cast, a formulae remains infused and available to consume (and thereby activate) until you complete a short rest. Creating formulae consumes raw materials, but the cost of these materials is insignificant and only requires that you have alchemist’s supplies available. If a spell normally has a costly material component, that component is expended during the process of infusing that particular formula. Formulae based on spells that require a focus do not require a focus. At 1st level, you have a formulae book containing three 1st-level alchemist formulae of your choice. At 1st level, you know two cantrips of your choice from the alchemist formulae list. You learn additional alchemist cantrips of your choice at higher levels as shown in the Cantrips Known column of the Alchemist table. You cast your cantrips as spells. See chapter 10 of the Player’s Handbook for the general rules of spellcasting and below for the alchemist formulae list. Intelligence is your spellcasting ability for your alchemist cantrips and formulae, since you learn your cantrips and formulae through dedicated study and experimentation. You use your Intelligence whenever a cantrip or formulae refers to your spellcasting ability. In addition, you use your Intelligence modifier when setting the saving throw DC for an alchemist cantrip or formulae you cast and when making an attack roll with one. Each time you gain an alchemist level, you can add one alchemist formula of your choice to your formulae book. Each of these formulae must be of a level equal to or less than your casting slots, as shown on the Alchemist table. On your adventures, you may find other formulae that you can add to your formulae book, in the same manner a wizard can add spells to her spellbook (see page 114 of the Player’s Handbook for more information on a wizard’s spellbook). If you find a wizard spell of 1st level or higher and that spell also appears on the list of alchemist formulae, you can add it to your formulae book if it is of a level equal to or less than your casting slots and you can spare the time to decipher and copy it. At 1st level, you discover how to create a mutagen that you can imbibe in order to heighten your physical prowess at the cost of your personality. It takes 1 hour to brew a dose of mutagen, which can be done while you complete a short rest. Once brewed, your mutagen remains potent until used. You can only maintain one dose of mutagen at a time and if you brew a second dose, any existing mutagen becomes inert. As with your formulae, a mutagen that is not in your possession becomes inert until you pick it up again. Strong Mutagen Advantage on Strength ability checks and saves, +2 damage on melee attacks, +1 AC, and disadvantage on Intelligence ability checks and saves. Sturdy Mutagen Advantage on Constitution ability checks and saves, +1 AC, +2 temporary hit points per level, and disadvantage on Charisma ability checks and saves. Swift Mutagen Advantage on Dexterity ability checks and saves, +2 AC, +10 ft to your walking speed, and disadvantage on Wisdom ability checks and saves. The effects of a mutagen last for 1 hour. A character without levels in the alchemist class who consumes a mutagen must make a DC 10 Constitution saving throw or be poisoned for 10 minutes. As your alchemical studies advance, you uncover new techniques known as discoveries that provide new ways for you to express your alchemical abilities. At 2nd level, you gain two discovery of your choice. Your discovery options are detailed at the end of the class description. When you gain certain alchemist levels, you gain additional discoveries of your choice, as shown in the Discoveries Known column of the Alchemist table. Additionally, when you gain a level in this class, you can choose one of the discoveries that you know and replace it with another discovery that you could learn at that level. At 3rd level, you begin to see benefits from specializing in a specific form of alchemy. You gain one of the following features of your choice. You gain proficiency with a herbalist’s kit and you can craft potions in your downtime activities in half the time normally required. Further, due to your advanced skill and training, you only consume half the raw materials normally required. You know the formula for creating all common potions and can learn the formula for other potions by spending 1 hour examining a sample (so, you could spend 1 hour examining a potion of fire breathing to learn the formula). This examination can be performed during a short or long rest. You can always identify a potion of poison when you inspect it. You also add the cure wounds formulae to your formulae book, if you do not have it already, and you can cast it a level equal to your spell slots without using a spell slot. You must complete a long rest before using this ability again. Finally, you also double the duration of any potion you consume. You gain proficiency with a poisoner’s kit and you can craft poisons in your downtime activities in half the time normally required. Further, due to your advanced skill and training, you only consume half the raw materials normally required. Your DM will tell you what poisons you are able to craft (you can peruse a selection of these at pages 257 and 258 of the Dugneon Master’s Guide). You also gain resistance to poison damage and have advantage on saving throws against poison. You create an alchemically infused item known as the Philosopher’s Stone. When you gain this feature, choose three cantrips from any class’s list. While the stone is on your person, you can cast those cantrips at will. They don’t count towards your total number of cantrips known. If you lose your Philosopher’s Stone, you can spend 1-hour with alchemist’s supplies to create a replacement stone. This procedure can be performed during a short or long rest, and it destroys the previous stone. The stone turns to ash when you die. Beginning at 9th level, you can place two different formulae into one casting slot. When it is consumed, both formulae take effect. If both of the formulae have a duration of Concentration, they share the same duration and both end when you either stop concentrating on the formulae or when your concentration is broken. The two formulae combined must both be at least two levels lower than that of your casting slots. For example, if your casting slots are 5th level, you can use this ability with any two formulae that are 3rd level or lower. You cannot place the same formula in a complex formula twice. At 11th level, your insights into the science of alchemy grant you a powerful new formulae called a breakthrough. Choose one 6th level formula from the alchemist formulae list as this breakthrough. You can cast your breakthrough formula once without expending a casting slot. You must finish a long rest before you can do so again. At higher levels, you gain more alchemist formulae of your choice that can be cast this way: one 7th level formula at 13th level, one 8th level formula at 15th level, and one 9th level formula at 17th level. You regain all uses of your Alchemical Breakthroughs when you finish a long rest. At 20th level, you cease aging. You can still be aged magically. You also choose two 3rd level formulae in your formulae book as your master formulae. You always have these formulae prepared, they do not count against the number of formulae you have prepared, and you can cast each of them once at 3rd level without expending a casting slot. When you do so, you can’t do so again until you finish a short or long rest. If you want to cast either formula at a higher level, you must expend a casting slot as normal. Beastmorphs study the anatomy of monsters, learning how they achieve their strange powers. They use their knowledge to duplicate these abilities, but at the cost of taking on inhuman shapes when they use mutagens. At 1st level you become proficient with the Animal Handling skill. You can also cast the speak with animals spell at will. Beginning at 6th level, your mutagen causes you to take on animalistic features of your choice, which can be based on those of an animal, an animal-like humanoid (such as a lizardman), or something more monstrous. For example, when you use your mutagen, you may gain a furry muzzle and pointed ears like a werewolf, scaly skin like a lizardfolk or sahuagin, or compound eyes and mandibles like a giant insect. Select one of the benefits listed in the alter self spell (page 212 of the Player’s Handbook) when you create the mutagen and that benefit persists as long as the mutagen. At 10th level, you add the polymorph formulae to your formulae book, if it is not there already. You can cast polymorph without expending a casting slot. When you do so, you can only target yourself and transform into a beast whose challenge rating is 1 or lower. Once you cast polymorph in this way, you can’t do so again until you finish a short or long rest, though you can still cast it normally using an available casting slot. At 14th level, you can choose to create a mutagen that transforms you into any beast whose challenge rating is 3 or lower, rather than provide the usual effects of a mutagen. The duration of this mutagen is 1 hour and otherwise follows the rules for the druid’s Wild Shape ability. An alchemist who studies anatomy and uses this knowledge to heal is a chirurgeon. At 1st level you become proficient with healer’s kits. Also starting at 1st level, your healing formulae are more effective. Whenever you use a formula of 1st level or higher to restore hit points to a creature, the creature regains additional hit points equal to 2 + the formula’s level. Beginning at 6th level, the healing formulae you cast on others heal you as well. When you cast a formula of 1st level or higher that restores hit points to a creature other than you, you regain hit points equal to 2 + the formula’s level. At 10th level, you add raise dead to your formulae book and can prepare and cast it like any of your other formulae. Starting at 14th level, you can use your mastery of alchemy and anatomy to dramatically improve the health of an injured or ill creature. By spending your action to touch a creature, you can cause it to heal 10d10 hit points, bringing its hit point total up to its maximum hit points. A psychonaut uses his knowledge to explore altered states of consciousness and even other planes of existence. At 1st level, your chemically-enhanced mind moves faster than most others, granting you advantage on initiative checks. Starting at 6th level, your insights into space and time grant you a limited ability to alter your fate. When you make an ability check or saving throw, you can use this feature to add a d10 to your roll. You can do so after seeing the initial roll but before any of the roll’s effects occur. At 10th level, you add teleportation circle to your formulae book and can prepare and cast it like any of your other formulae. You also add the misty step formulae to your formulae book, if it is not there already. You can cast misty step without expending a casting slot. Once you cast misty step in this way, you can’t do so again until you finish a short or long rest, though you can still cast it normally using an available casting slot. Object Reading. Holding an object as you meditate, you can see visions of the object’s previous owner. After meditating for 1 hour, you learn how the owner acquired and lost the object, as well as the most recent significant event involving the object and that owner. Intelligence score), you can spend 10 additional minutes for each owner to learn the same information about that creature. street, tunnel, clearing, or the like, up to a 50-foot cube), going back a number of days equal to your Intelligence score. You learn about one significant event, beginning with the most recent, up to a maximum number of significant events equal to your Intelligence score. Significant events typically involve powerful emotions, such as battles and betrayals, marriages and murders, births and funerals. However, they might also include more mundane events that are nevertheless important in your current situation. A reanimator is an alchemist who has discovered how to infuse a corpse with a semblance of life. Many work in tandem with necromancers to explore the fine border between the worlds of the living and the dead. Also at 1st level, you gain the chill touch cantrip, which doesn’t count towards your total number of cantrips known. At 6th level, when you cast animate dead, you can target one additional corpse or pile of bones, creating another zombie or skeleton, as appropriate. The creature’s hit point maximum is increased by an amount equal to your alchemist level. The creature adds your proficiency bonus to its weapon damage rolls. Beginning at 10th level, you have resistance to necrotic damage, and your hit point maximum can’t be reduced. You have spent so much time dealing with undead and the alchemical forces that animate them that you have become inured to some of their worst effects. Starting at 14th level, you can use your dark science to bring undead under your control, even those created by others. As an action, you can choose one undead that you can see within 60 feet of you. That creature must make a Charisma saving throw against your alchemist spell save DC. If it succeeds, you can’t use this feature on it again. If it fails, it becomes friendly to you and obeys your commands until you use this feature again. Intelligent undead are harder to control in this way. If the target has an Intelligence of 8 or higher, it has advantage on the saving throw. If it fails the saving throw and has an Intelligence of 12 or higher, it can repeat the saving throw at the end of every hour until it succeeds and breaks free. You can also replace one of your Alchemical Breakthroughs with create undead. A vivisectionist studies bodies to better understand their function. Unlike a chirurgeon, a vivisectionist’s goals are not related to healing, but rather to experimentation and knowledge that most people would consider evil. As a member of the vivisectionist college, you do not gain college formulae, as the members of other colleges do. Instead, at 1st level, your studies of anatomy teach you how best to injure another creature so as to inflict maximum harm on them. Once per turn, you can deal an extra 1d6 damage to one creature you hit with an attack if you have advantage on the attack roll. The attack must use a finesse or a ranged weapon, but cannot be used with a bomb created by the bomb cantrip. The amount of the extra damage increase as you gain levels in this class (or in the Rogue class), as shown below. Beginning at 6th level, you gain advantage on attack rolls against any creature that hasn’t taken a turn I the combat yet. In addition, any hit you score against a living creature that is surprised is a critical hit. At 10th level, you add contagion to your formulae book and can prepare and cast it like any of your other formulae. Starting at 14th level, when you attack and hit a living creature with a weapon attack (including the bombs created by the bomb cantrip), you can cause it to take 10d10 extra damage. This damage is not doubled on a critical hit. If an alchemist discover has prerequisites, you must meet them to learn it. You can learn the alchemist discovery at the same time that you meet its prerequisites. When you cast bomb, you can choose to have it do acid damage instead of fire damage. If so, the target hit takes damage from the bomb again at the start of its next turn. This discovery cannot be used with any other discoveries that alter the effects of the bomb cantrip. You have a pool of healing power that replenishes when you take a long rest. With that pool you can restore a total number of hit points equal to your alchemist level x5. As an action, you can draw from the pool to restore a number of hit points to yourself equal to the maximum amount remaining in your pool. Alternatively, you can expend 5 hit points from your pool of healing to cure yourself of one disease or neutralize one poison affecting you. You can cure multiple diseases and neutralize multiple poisons with a single use of Alchemical Regeneration, expending hit points separately for each one. If you are incapacitated because of hit point damage, and you have points remaining in your pool, you automatically regain enough hit points to regain consciousness, if enough points are available in your pool. You can cast simulacrum without expending a casting slot, though you must pay the normal component cost. Casting this spell takes 12 hours and you must have access to alchemist’s supplies. You must finish a long rest before you can do so again. You can create a zombie, as if created by the animate dead spell by spending 1 hour performing alchemical treatments on a corpse. This procedure can be performed during a short or long rest. You must have access to a relatively intact corpse to use this ability. The created zombie has its hit point maximum increased by your level and adds your proficiency bonus to damage rolls. You can only have one alchemical zombie created at a time, but, once created, it lasts until destroyed. When you cast bomb, you can choose to have it do thunder damage instead of fire damage. If so, the target hit makes a Constitution saving throw and is deafened until the start of your next turn on a failed save. This discovery cannot be used with any other discoveries that alter the effects of the bomb cantrip. When you cast bomb, you can choose to have it do half the normal fire damage. If so, the target hit makes a Wisdom saving throw and is affected by a confusion spell until the start of your next turn on a failed save. This discovery cannot be used with any other discoveries that alter the effects of the bomb cantrip. When you cast bomb, you can choose to place the bomb so that it explodes a number of rounds after you place it, up to a maximum of one minute. If at any point you reclaim the delayed bomb, you can end the timer and prevent its detonation. The delayed bomb detonates immediately if any other creature attempts to touch or move it, or if the bomb’s contents are removed from the vial (such as if the vial breaks). The bomb deals damage as if it scored a direct hit to any creature in contact with the bomb when it detonates, and splash damage to all adjacent creatures as normal. You cannot have more than one delayed bomb at one time. At the cost of one quarter the market price of a potion in raw materials, you can create a second copy of a potion by spending 1 hour working with the potion (so, you could spend 1 hour working with a potion of fire breathing to create a second copy). This work can be performed during a short or long rest. Once a potion has been diluted, it cannot be diluted a second time. When you cast bomb, you can choose to have it function as a counterspell or dispel magic spell on a hit, instead of doing damage. You choose which of the two effects the bomb will have when you cast bomb. If you choose the counterspell effect, you can throw it as a reaction when you see a creature within 60 feet of you casting a spell. This discovery cannot be used with any other discoveries that alter the effects of the bomb cantrip. You can cast simulacrum without expending a casting slot, though you can only create a duplicate of your own body. Casting this spell takes 1 week of downtime, and requires 1,000 gp worth of alchemical reagents, and you must have access to alchemist’s supplies. You must finish a long rest before you can do so again. As an action, you may shift your consciousness from your current body to any one of your available doppelganger simulacra, which must be on the same plane as you. If killed in a simulacrum, you transfer to your own body automatically; if killed in your own body, though, you are dead. Unused simulacra (including your abandoned original body) appear to be lifeless corpses, though they do not decay. You can cast the true resurrection spell once without expending a casting slot, though you must pay the normal component cost. Casting this spell takes 1 hour and you must have access to alchemist’s supplies. You must finish a long rest before you can do so again. When you cast bomb, you can choose to have it do half damage to creatures within 10 feet, rather than the normal 5 feet. This discovery cannot be used with any other discoveries that alter the effects of the bomb cantrip. When you cast bomb, you can infuse a single arrow, crossbow bolt, or one-handed firearm bullet with the power of your bomb, load the ammunition, and shoot the ranged weapon. When the infused ammunition hits its target, it deals damage normally and detonates as if you had thrown the bomb at the target. If the explosive missile misses, it does not detonate. When you cast bomb, you can choose to have it do force damage instead of fire damage. If so, the target hit makes a Strength saving throw and is knocked prone on a failed save. This discovery cannot be used with any other discoveries that alter the effects of the bomb cantrip. When you cast bomb, you can choose to have it do cold damage instead of fire damage. If so, the target hit makes a Constitution saving throw and its speed is reduced by 10 feet until the start of your next turn on a failed save. This discovery cannot be used with any other discoveries that alter the effects of the bomb cantrip. You may now use your alchemical regeneration discovery on others, as an action. When you cast bomb, you can choose to have it duplicate the effect of an incendiary cloud spell for a radius of 10 feet for one round instead of its normal damage. This discovery cannot be used with any other discoveries that alter the effects of the bomb cantrip. When you cast a formula, you can infuse it with an extra bit of your own magical power. The formula created now persists even after you set it down. An infused formula can be imbibed by a non-alchemist to gain its effects. You have advantage on death saving throws. When you cast bomb, you can choose to have it do psychic damage instead of fire damage. If so, the target hit makes a Charisma saving throw and it suffers disadvantage on all Intelligence, Wisdom, and Charisma ability checks and saving throws until the start of your next turn on a failed save. This discovery cannot be used with any other discoveries that alter the effects of the bomb cantrip. You still only create one bomb with each casting of bomb, but you can have a maximum of two bombs created at any given time. By applying an alchemical process to your own body, you no longer require natural sleep, nor can you be put to sleep by magic. Further, you gain immunity to cold damage and the paralyzed effect. You can now create two mutagens at once, though you can only be affected by one mutagen effect at a time. Further, you no longer impose disadvantage on any ability checks or saving throws when you consume mutagens. Other creatures can now consume your mutagens and gain the benefit (and penalties) of their effects. Your two vestigial limbs are part of a parasitic twin on your torso, consisting of a head, a torso, and two arms (from the vestigial limb discovery). Normally, your twin is mostly recessed within your body, with the visible arms acting like the vestigial limb discovery, though you can manifest or hide the twin as a bonus action. The twin is helpless, fully subservient to you, and cannot be targeted or harmed. If you succumbs to a mental effect that would make him incapacitated, restrained, stunned, or unconscious, or not in control of his own actions (such as charm person, feeblemind, or hold person), you can reroll your saving throw. Success means your twin absorbs the effect and you can ignore it. Once you use this ability, you can’t use it again until you complete a long rest. When you cast bomb, you can choose to have it duplicate the effect of a cloudkill spell for a radius of 10 feet for one round instead of its normal damage. This discovery cannot be used with any other discoveries that alter the effects of the bomb cantrip. When you throw a bomb created by the bomb cantrip, you can choose any number of creatures to be unaffected by the bomb. You gain resistance to critical hit damage and the extra damage from sneak attacks, such as the rogue’s class ability and the vivisectionist college ability. When you cast bomb, you can choose to have it do lightning damage instead of fire damage. If so, the target hit makes a Constitution saving throw and it suffers disadvantage on all attack rolls until the start of your next turn, on a failed save. This discovery cannot be used with any other discoveries that alter the effects of the bomb cantrip. When you cast bomb, you can choose to have it duplicate the effect of a fog cloud spell instead of its normal damage. This discovery cannot be used with any other discoveries that alter the effects of the bomb cantrip. When you cast bomb, you can choose to have the target hit takes damage from the bomb again at the start of its next turn. When you apply poison to a weapon it lasts for a number of attacks equal to your Intelligence modifier. When you cast bomb, you can choose to have it duplicate the effect of a stinking cloud spell for a radius of 10 feet for one round instead of its normal damage. This discovery cannot be used with any other discoveries that alter the effects of the bomb cantrip. You learn the find familiar spell and can cast it as a ritual. However, the familiar you summon is a tumorous growth that appears on your body, usually your back or stomach. You can detach the familiar from your body as an action, at which time it takes a form roughly approximating one of the animal normally summoned by find familiar. The tumor familiar is otherwise treated identically to familiars summoned by find familiar. You can reattach your tumor familiar to your body as an action. You gain an extra arm, leg, or tentacle. The limb is fully under your control and cannot be concealed except with magic or bulky clothing. The limb does not give you any extra attacks or actions per round, though an arm or tentacle can wield a weapon and make attacks. Note that, while the extra limb can be used with Two Weapon Fighting, you only gain a single extra attack as a bonus action with Two Weapon Fighting, subject to the normal penalties (no attribute bonus to damage). An arm or tentacle can manipulate or hold items as well as your original arms (for example, allowing you to use one hand to wield a weapon, another hand to hold a potion, and the third hand to throw a bomb). You must have armor made to accommodate your limb, and clothing not made to accommodate it (or them) might be destroyed. You may select this discovery twice. You sprout a pair of wings from your back, gaining a flying speed equal to your current speed. You must have armor made to accommodate your wings, and clothing not made to accommodate them might be destroyed. You swiftly mix volatile chemicals and infuse them with your magical reserves to create a powerful bomb. You are considered to be proficient with the bomb and it is a weapon with the finesse, light, and thrown properties and a range of 20/60. You throw the bomb as if it were a finesse thrown weapon (using your proficiency bonus plus your choice of either your Strength or Dexterity modifier to hit), but you do not add your attribute modifier to the damage of the bomb. Instead, the bomb deals 1d8 fire damage to the target and half damage to all other creatures within 5 ft of the target, or no damage on a successful Dexterity saving throw. A flammable object directly hit by the bomb ignites if it isn’t being worn or carried. You can only have one bomb created by this cantrip at any given time. The bomb’s damage increases by 1d8 when you reach 5th (2d8), 11th level (3d8), and 17th level (4d8). For characters who wish to multiclass as an alchemist, the minimum ability score to multiclass as an alchemist is Intelligence 13. Further, when you multiclass into the alchemist class you gain proficiency in light armor and alchemist’s supplies. Formulaic Alchemy. If you have both the Spellcasting class feature and the Formulaic Alchemy class feature from the alchemist class, you can use the casting slots you gain from the Formulaic Alchemy feature to cast spells you know or have prepared from classes with the Spellcasting class feature, and you can use the spell slots you gain from the Spellcasting class feature to cast alchemist formulae you know. To explain the logic behind my 5E Alchemist, it may be best to start by looking at the PF version. The PF Alchemist has spell slots like a Bard, a generous helping of bombs per day (starting at roughly 4-6 bombs per day and rising to 23-30 per day at 20th level), and buffing effects from mutagens and extracts. As with many PF classes, the PF Alchemist provides many opportunities to customize your Alchemist character through a selection of discoveries which either tweak one of the Alchemist’s signature abilities or provides some other alchemically-themed power. This variety of abilities makes for a lot of potential customization in the PF Alchemist class, but it also makes for a lot of stuff to keep track of and more class-specific terminology than seemingly any other PF class (formulae, extracts, mutagens, discoveries, bombs). I have tried to simplify this a bit for 5E, though I still kept the mutagens as a separate ability, in order to maintain the “Mister Hyde” vibe that the PF mutagens have. In PF, it is common for characters to stack their buffs, meaning several extracts would be used in any given encounter. 5E mostly prevents this stacking through the Concentration mechanic (which restricts casters to maintaining one Concentration spell at a time). As such, it seems likely that an Alchemist in 5E would only be casting one or two formulae per encounter, meaning that they probably wouldn’t need a ton of spell slots in any given day, particularly if their mutagen and bomb abilities continued to draw on separate resources. With that in mind, I looked to the 5E Warlock class, whose limited number of spell slots recharge on a short rest, as a starting point for converting the Alchemist. Further, the variety of invocations that 5E Warlocks choose as they gain levels seemed like a good model for the Alchemist’s discoveries. Therefore, I felt that the Warlock was a better model for the Alchemist than the 5E Bard or the Wizard. For the bomb ability, I decided it would be best to just make it a cantrip available to all Alchemists. Damaging cantrips in 5th edition D&D scale as a character gains levels, which nicely emulates the PF Alchemist’s bombs, which do more damage as a character gains levels too. I think this also provides a way for the players of Alchemists to decide whether or not their character can create bombs without having to add or remove the bomb ability, based on the alchemist’s archetype/alchemical college (the 5E design philosophy seems to avoid taking away class abilities from characters too, which gives another reason to think this is the best way to go with alchemist bombs). 5E does this with some class abilities from earlier editions (for instance 4th edition D&D’s Hunter’s Mark, Curse, and Eldritch Blast class abilities became spells or cantrips in 5E), which makes the choice to make Alchemist’s bombs a cantrip a design decision consistent with other 5E mechanics. For the extracts/formulae, I decided to do away with the “extract” terminology altogether. I decided to abandon the PF mechanics for how Alchemists prepare their extracts altogether, as I felt they were more restrictive than any other 5E class’ spellcasting abilities. Instead, 5E Alchemists have to prepare a list of formulae, just like a 5E Wizard does, and they can then spend their casting slots to prepare any of those prepared formulae as a bonus action. 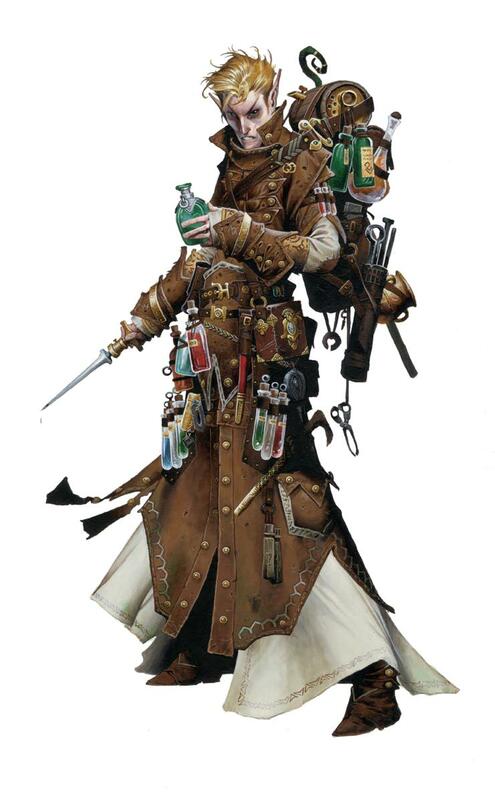 Like their PF counterparts, the infused formulae of a 5E Alchemist retain their power for a relatively long time, meaning that the 5E Alchemist can enter an encounter with a bunch of ready-to-drink formulae on him (or he can hand them out to his allies beforehand, if he has the Infusion discovery). This makes for a significantly different mechanic for the Alchemist’s “spellcasting” in 5E than in PF, but I think it is the best option for capturing the “feel” of the PF Alchemist’s abilities, while also being mindful of the significant differences between the PF and 5E rules. For the mutagens, since 5E does away with the kind of flat boost to attributes that the PF mutagens grant, I had to find alternate mechanics for each of the three varieties available in PF, so I based these loosely on the Enhance Ability spell. Since 5E has a bounded accuracy mechanic, I didn’t feel that the improved versions of mutagen granted by discoveries should give a flat, increased mechanical bonus. Instead, I designed the two mutagen discoveries to grant versatility to the mutagen ability (expanding the player’s mutagen abilities “out” rather than “up”). The final significant change I made to the PF version of the Alchemist was to add the Complex Formulae ability (which duplicates the PF Alchemist’s combine extracts discovery) as a default ability for all Alchemists. Since the Alchemist’s formulae are restricted to buffs, I didn’t feel that this ability was too powerful and it allows the 5E Alchemist to get more bang for her buck out of her lower level formulae. 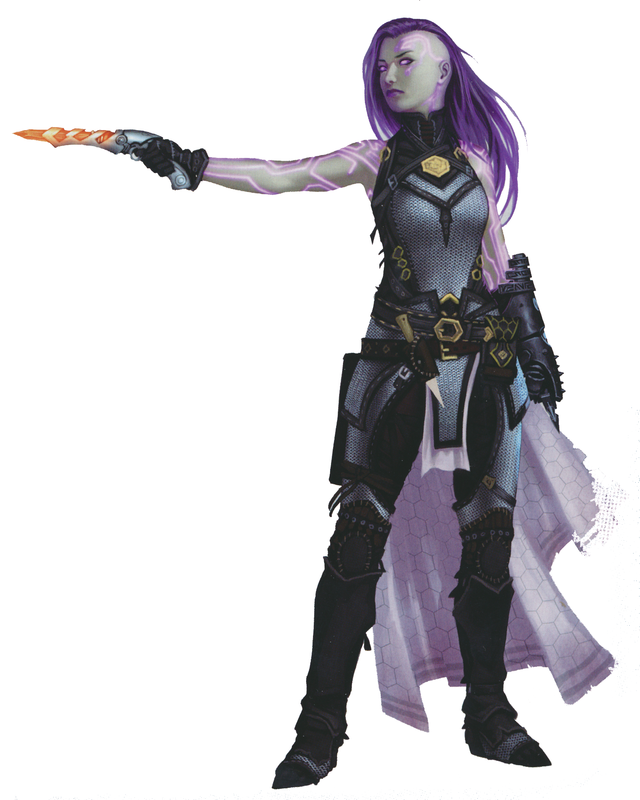 This also gives the 5E Alchemist a unique ability that no other class has (which is to maintain two spells at the same time), which should help make them feel even more unique at the table. Since the Alchemist’s abilities are so strongly linked to the theme of a “magical chemist” it is tricky to find easy ways to repurpose these rules as another class. At best, you could try describing the “special effects” of these abilities differently to make a character feel unique (for instance, describing an elven alchemist as a eldritch botanist whose “bombs” are explosive seeds, whose “mutagens” are specially grown fruits, and whose “formulae” are herbal teas infused with primal magic). With draft rules done for the Alchemist class, I now have both of the classes I needed to run the Iron Gods Adventure Path using the 5th Edition D&D rules. Next on my to-do list for Iron Gods will be backgrounds for Kellid Tribesmen and Member of the Technic League, along with a slew of monster conversions and possibly rules for the Gunslinger as a Fighter archetype in 5E!